I founded Marriott Statistical Consulting Ltd in 2006 but prior to that I worked at Mars UK Ltd for 9 years. In the UK, Mars are split into 4 businesses covering Chocolate (Mars, Galaxy, Maltesers, Snickers, Twix, etc), Petcare (Whiskas, Pedigree, Royal Canin, etc), Food (Uncle Ben’s, Dolmio, Seeds of Change, etc) and Drinks (Klix, Flavia, etc). If you visit the government’s gender pay gap data website, you can find out what the pay gaps are for each of these businesses which are shown in the graphic below. 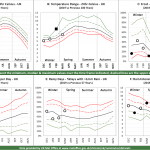 For an explanation of the chart format, please read my post “the 7 ways to misuse gender pay gap data”. You can also retrieve the same data by downloading my spreadsheet Gender Pay Gap Data & Chart Tool v1.0. It is important to note that the four businesses are different in size. Both the Chocolate and Petcare businesses are categorised as having 1,000-4,999 employees whilst the Food and Drinks business are stated to have between 250-499 employees. For the purposes of the simulation model I will be using, I will assume that Food and Drinks have 300 employees (known as Associates within Mars) each and Chocolate and Petcare will have 9 times as many employees i.e. 2700 employees/associates each. The median pay gaps among these four businesses could not better demonstrate the point I want to get out of this article. 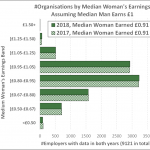 For the two larger businesses the median woman earns £0.94 & £1.08 for every £1 the median man earns and for the two smaller businesses, the median woman earns £1.18 and £0.89. Notice how the variation in pay gaps is much smaller for the two larger businesses compared to the two smaller businesses. A statistical theory known as the Central Limit Theorem states that if you increase your sample size (i.e. number of employees) by a factor of 9, the margin of error in your results will fall by a factor equal to the square root of 9 i.e. 3. Sure enough, the largest pay gap of 18p from the two smaller companies is 3 times the smallest pay gap of 6p from the two larger companies. At first sight all this is what would be expected if Mars UK was a genuinely non-discriminating company when it comes to pay & promotion and this is especially the case since I know from my own experience that Mars has the SAME PAY SYSTEM in all 4 companies. This point is critical to my argument here so I want to use my inside knowledge (as of 2006 but I doubt if things have changed much) to describe the main features of the Martian pay system (and yes we did call ourselves Martians!). My company is not yet large enough to need a pay system but if I ever did need one, I would have no hesitation basing it on the Martian system. It is my belief that organisations with pay systems will have smaller gender pay gaps than organisations without a pay system though that does not mean that all pay systems are equally good. A good pay system should be based on clear principles that are widely understood and pay progression should be based solely on performance. What I experienced on Mars is that the Martians come pretty close to this ideal so how does it work on Mars? There are 13 pay bands globally (known as zones on Mars) but in practice, Mars UK only uses about 10 of these. Each job is evaluated on a scale which weights the degree of responsibility and accountability entailed by the job and this evaluation determines which of the 13 pay bands the job is allocated to. Each pay band has a BASE salary plus an INCREMENTAL scale up to a maximum increment in discrete steps. For example band 8 might start at £30k and go up to a maximum of £50k in steps of £1,000 e.g. you can earn £33k, £41k, £44k, etc but not £36.5k. The base salaries for each pay band will increase (or decrease in the case of management level bands) over time depending on sales performance and salary comparisons with other companies. Pay progression within a pay band is based on performance evaluations and the outcome is that your salary goes up by 0, 1, 2 or 3 steps. 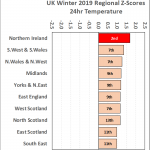 Crucially, the performance evaluations are pooled at a business/site/divisional level to see if any major anomalies are occurring before the pay progression is confirmed. For example department A might give everyone a 3 step increase and department B might give no-one any increases. This calibration exercise asks why is this the case and can be particularly helpful in identifying unconscious discrimination e.g. if dept A was mostly male and department B mostly female and these performance evaluations were confirmed, it could disadvantage women. Mars was always conscious of gender disparities in my time there and whilst I will contend that they are near perfect when it comes to pay and progression, it should be noted that they still have some way to go on overall female employment. From the chart above, you can see that the four businesses vary between 31% and 41% in terms of the % of employees who are women and the average is just under 37%. For the purpose of this article, I will assume that the gender ratio on Mars is 5 to 3 male to female i.e. 37.5% female. This is the imaginary company that I have created for my simulation model. It consists of 7 pay bands where band 1 is the lowest paid and band 7 is the highest paid. Only the Managing Director is in band 7, everyone else is in bands 1 to 6. 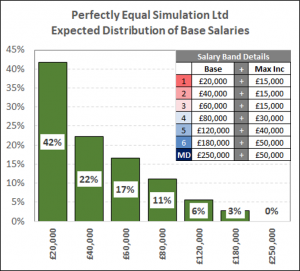 The chart here shows the base salary and the incremental scale for each pay band and also the expected distribution of base salaries within the company. On average, 42% of employees will be in band 1 and only 3% in band 6 but in practice due to employee turnover, reorganisations, etc, the actual % of employees in each band will vary. 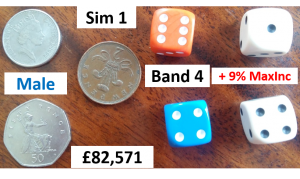 So our simulation model needs to allow for such variation and there is a statistical tool known as the binomial distribution which I could have used but in order to keep things simple, I will be using coins and dice instead. To begin with, let’s assume that Perfectly Equal Simulation Ltd has 300 employees and does not discriminate at all when it comes to pay and progression. However, it is not equal in terms of gender splits and on average 3 out of 8 employees are female. Our first employee will always be the band 7 employee i.e. the managing director, but thereafter we will use coins and dice to determine the gender of the employee, the pay band they are in and where they are on the incremental scale. We therefore need a set of rules for interpreting our coin tosses and dice throws in order to make these decisions. The rules are shown in the graphic. The 3 coins determine the gender of the employee, 2 die determine the pay band and another 2 die determine the increment. Let’s explore each in turn. As you can see, when you toss 3 coins, each coin can either be heads or tails and there are 8 possible permutations that can arise with 3 coins. 3 of these are permutations which have 2 heads and 1 tail and if I toss any of these, the simulated employee will be female. If I toss any of the other 5 permutations, the simulated employee will be male. For the pay band, two die are thrown, one of which is denoted to be the first dice and the other is the second dice. 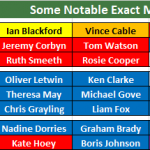 This time we have 6×6=36 possible permutations which are laid out as a 6×6 table in the graphic. I have then allocated each permutation to a pay band as shown. So only 1 permutation (6,6) will result in a band 6 employee whilst there are 15 permutations (e.g. 1 then 4) that result in a band 1 employee. 15/36 = 42% and 1/36 = 3% which is what we see in the chart in the earlier section. For the pay increment, two die are thrown and the resulting two numbers are multiplied together. So 5 and 4 would give you 20. You then subtract 1 to get 19 in our example and divide this by 35 to get 54%. 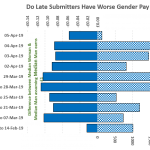 The increment will then 54% of the relevant maximum increment for the simulated pay band as shown in the earlier chart. I’ve chosen to use this system as most pay systems will not divide increments into equal sized steps but rather increase the step size by a certain percentage. This what the rules I have come up with here tries to mimic. I am sure that you can see that it is possible with this system to come up with your own rules for deciding gender, pay bands and increments. By the way, my simulation model does not allow for any bonuses and the reported median gender pay gap is supposed to include bonuses. In the case of Mars, their bonus system means that nearly everybody receives a bonus of some kind. Two simulations are demonstrated in the images below. 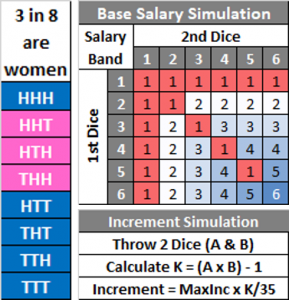 Each image uses the rules shown above and arrives at the simulated genders and salaries shown. It is worth checking that these are right. For the pay band, the orange dice is the first dice (rows in the table) and the blue dice is the second dice (columns in the table). I will let you work out what THH, 3 then 2 followed by 2 and 5 would lead to. Having decided the rules for your coins and dice, you can then apply these to create a single simulation where our company has 300 employees. 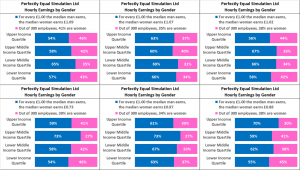 This would be our first company simulation and the 300 simulated employees can then be analysed to calculate the median gender pay gap and the gender splits by income quartile. Of course, one cannot draw conclusions solely from one simulation but a computer can rapidly replicate the coin and dice throws and create many company simulations. The graphic shows 6 such simulations, 3 where the median woman is paid more than the median man and 3 where the median woman is paid less than the median man. 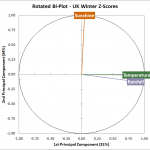 It is worth comparing these simulations with the actual results for Mars Food and Drinks. The percentage of employees that are women varies between 34% and 41%, a difference of 7% which is similar to the difference between Food and Drinks. 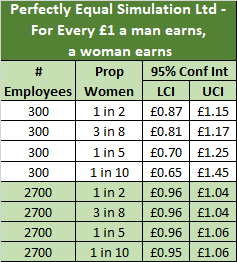 One simulation has a 27p pay gap which just goes to show how much variation can be expected purely through the laws of chance even when a company has no discriminatory practices at all. Obviously, even 6 company simulations are not enough and I ended up doing 5000 company simulations in all. For each of these, I calculated the median gender pay gap and the chart below shows the distribution of these 5000 simulated median gender pay gaps for an organisation with 300 employees in a 5:3 male:female gender ratio. 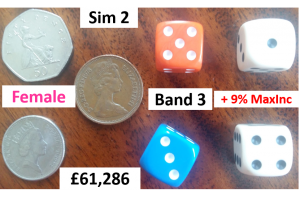 It turns out that 80% of the simulations result in the median woman earning between £0.93 and £1.08, 95% result in the median woman earning between £0.81 and £1.17 and 99% of the simulations result in the median woman earning between £0.73 and £1.32. When I compare these simulations with Mars Food’s median woman of £1.18 and Mars Drinks’ median woman of £0.89, I find that Food is in the top 3% and Drinks in the bottom 3% of simulations. If you didn’t know that these two companies had the same pay system, you might think that whilst their pay gaps are plausible with non-discrimination under the laws of chance, they are towards the extreme end of plausibility and perhaps there might be an issue to look at. 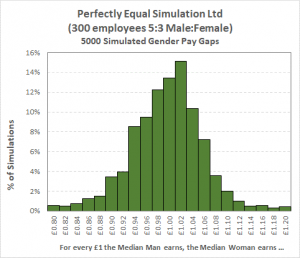 But when you factor in that my simulation model does not include any simulation of bonuses whereas the reported figures do, you can immediately see that there is an extra element of chance which will increase the range of plausible median gender pay gaps. That and the fact that both Food and Drinks use the same pay system means that to my mind, there is no evidence based solely on the reported gender pay gap figures that the Mars pay system is discriminatory with respect to gender. If I repeat my company simulation model but this time for an organisation of 2,700 employees (to represent Mars Chocolate and Petcare), I will end up with simulated examples as shown in the six charts below. This time, we see that the degree of variation in possible gender pay gaps looks to be considerably smaller. 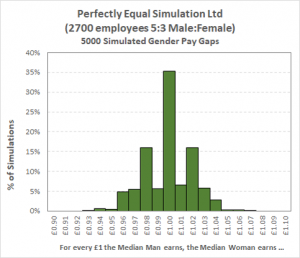 Once again, I undertook 5000 such simulations and the distribution of possible median gender pay gaps is shown in the histogram here. 80% of the time, the median woman earns between £0.98 and £1.03, 95% of the time she earns between £0.96 & £1.04 and 99% of the time, she earns between £0.95 and £1.06. 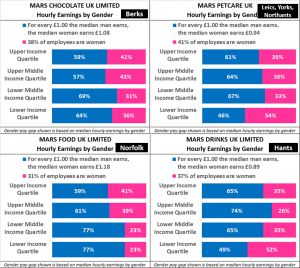 Therefore, Mars Chocolate’s median woman’s earning of £1.08 put them in the top 1% of plausible median pay gaps and Mars Petcare’s median woman’s earning of £0.94 puts them in the bottom 1% of plausible median pay gaps. 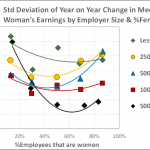 Again, I repeat that my simulation model does not include bonuses, which can expand the range of plausible range of median gender pay gaps, and that these two companies use the same pay system so it is much more plausible to conclude that there is no evidence of gender discrimination on Mars. Otherwise, we would have to conclude that the lovely smell of chocolate causes women to discriminate against men and the horrible smell of (wet) petfood causes men to discriminate against women! Now that I have set up my simulation model, I can change the rules for determining gender, pay band and increment to anything I wish. Of particular interest to me is how does the range of plausible median gender pay gaps change if I change the gender split in the organisation? I carried this out using the same pay bands and increments but for three other gender splits, 50% women, 20% women and 10% women. The results for the 95% confidence interval (the plausible range where you would expect the pay gap to end up 95% of the time) are shown in the table. Two things should strike you about this table. For larger companies, any company reporting a median gender pay gap of 5% or less cannot be accused of gender discrimination in the absence of any other evidence. For smaller companies, it is difficult to prove discrimination solely on gender pay gap data, especially when women make up a small proportion of the workforce. This does raise the question of whether the threshold of 250 employees is in fact too low and perhaps the threshold should be 1,000 employees before a company has to report its gender pay gap. More importantly, it also shows that if you substitute women for a minority (say disabled people) in the scenario where 1 in 1o employees are in the minority category, then you will again be unable to draw any meaningful conclusions. This explains why I am opposed to mandatory pay gap reporting for ethnicity, sexuality, disability, etc.